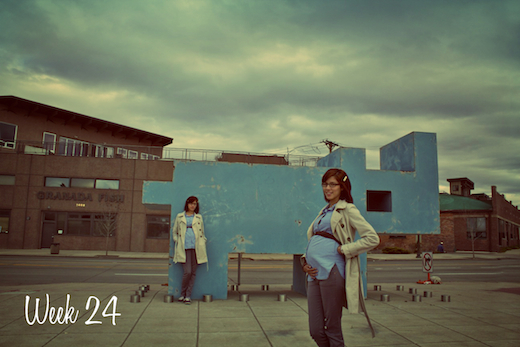 Week 24...we just keep rolling along in this pregnancy. Liam is supposed to be about a foot long by now. Does that sound crazy to anyone else but me?! I can't get over the fact that there's an actual person growing inside of me. Unfortunately, I've been dealing with a lot of pelvic pain lately. My exercise ball is my best friend right now. It relives some pressure when I sit on it rather than the couch or a hard chair. I've also been looking up some different pelvic exercises to help me out. But I definitely need to bring this up with my midwife next time I see her because it gets pretty bad at times. Anyway, if you go to the intersection of 24th St. and Larimer you'll see this big blue rhino. This is because it is the entrance to the RiNo Art District of Denver (RiNo = River North). This place is full of galleries, studios, theaters, etc. I love that Denver has a thriving art community and that you can find random sculptures like this all over town. It's part of what makes Denver unique and fun.